As always, the past 3 months since 22nd June have been crazy busy. The bears might still be around, but the show must go on and of course has not slowed the Groestlcoin development team in the slightest. Integrated into the bitbns exchange, with the ability to buy Groestlcoin directly with the Indian Rupee. Groestlcoin Rebrand Vote – Whilst there was much talk and push for a rebrand vote, the overall result was almost unanimously in favour of keeping our unique and conversation-starting name. With just 83 votes to Rebrand, and 2577 votes to No Rebrand. Thank you for all who voted, the funds raised are being used to fund ongoing hosting and development costs. Integrated into the Cryptobridge exchange. Cryptobridge is a popular decentralised exchange where you always hold the private keys to your funds, only YOU have access to them. Groestlcoin has been added to SimpleSwap – Groestlcoin can now be swapped with over 100 other cryptocurrencies, without signing up! Groestlcoin has been added to UnoDax, one of the leading cryptocurrency exchanges in India, with TUSD, BTC and INR trading pairs. Groestlcoin has been added to SwapLab.cc, where you can buy Groestlcoin using Bitcoin and over 50 other altcoins. Purchasing with VISA/Mastercard is coming VERY SOON. Groestlcoin has been listed on #3 largest exchange in the world on volume, Huobi Global! More on this to come further on in the announcements. Groestlcoin has been added to the Guarda Multi-Currency Wallet. Groestlcoin has been added to Melis Multi-Device, Multi-Account, Multi-Platform, Multi-Signature advanced wallet! Already this list is far more than most other cryptocurrencies have achieved in the past 3 months. But this is just the tip of the iceberg of what has been developed. We are very excited to launch this new payment processor to push forward the adoption of Groestlcoin. Within an hour your website can be accepting Groestlcoin payments and donations seamlessly thanks to GRSPay and several e-commerce platforms. GRSPay is a free and open-source payment processor which allows you to receive payments in Groestlcoin with no fees, transaction costs or middlemen. GRSPay is a non-custodial invoicing system which eliminates the involvement of a third-party. Payments with GRSPay go directly to your wallet, which increases privacy and security. Your private keys are never uploaded to the server and there is no address re-use, since each invoice generates a new address deriving from your xpubkey or zpubkey. • Lightning Network support coming very soon! • Ability to run GRSPay as a self-hosted solution on your own server, or ability to use our host. The self-hosted solution allows you not only to attach an unlimited number of stores (and use the Lightning Network soon), but also become the payment processor for others. How to use WooCommerce store with GRSPay? Why can’t I just give my Groestlcoin address to a buyer? After the payment, the software notifies your store that the order has been paid/completed. Depending on the e-commerce software you’re using, it can also change the order status. You worry about getting items shipped, leave the invoicing and payment processing to GRSPay. Does GRSPay need my private keys? Absolutely not. The fact that GRSPay never needs access to your master private key for on-chain transactions is a huge security advantage. Even if our server gets hacked, your funds from the on-chain transactions are always safe. Securing your on-chain funds, comes down to your own security. When we will support lightning node, GRSPay technically will have access to the keys (macarons) of your LN. How does GRSPay create different addresses? Do I need to have an online store to accept Groestlcoin? You can use GRSPay even if you don’t have an e-commerce store. You can launch your GRSpay and be the payment processor for your friends or local market. Another use-case is to accept donations through the PoS (Point of Sale) app or payment buttons which can be copy-pasted as HTML snippets into any website. 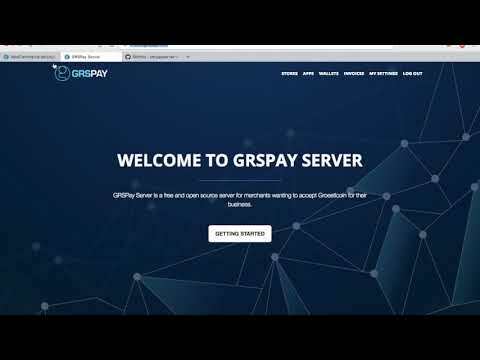 Does GRSPay Server support groestlcoin to fiat conversion? Does GRSPay Support Lightning Network? Not yet, but soon. We want to ensure Lightning Network is fully working and stable. What is a “network cost”? The network cost in GRSPay is not the same thing as the mining fee. Your customer would still need to pay for the miner’s fee. The network cost is an optional feature. It’s enabled by default, but it’s entirely up to a merchant to enable or disable it. Your customers will be able to see this “network cost” at the checkout when they expand the invoice information. While it protects dust transactions, it can also reflect negatively and your customers might have additional questions and may lead them into thinking you’re overcharging them. If you’re getting this error, this means that you have not connected your wallet to GRSPay. In Store>Settings> Derivation Scheme, on the right-hand side click modify and set up your derivation scheme correctly. The the most advanced wallet for Bitcoin, Bitcoin Cash, Litecoin and now Groestlcoin. With Melis you have the complete control of your bitcoins and private keys, you can define spending limits policies and make use of two or more factors authentication. Melis is open source, published on GitHub. You can create as many accounts as you want. An account is a part of your wallet that can be customised to your requirements. You can choose how many co-signers are required to spend funds. The accounts are completely independent and act like separate wallets from each other but can be accessed via the same details. A core feature of Melis is the ability to set a ‘primary’ device. With this you can set an account as ‘Secure’ so it is only viewable (and accessible at all) from the Primary device. You can have a savings account hidden from the outside world whilst also having your ‘spending’ funds available on the go. With Melis you can create a multi-signature account between N people, where up to N signatures are required to sign a transaction, choosing if any of those should be mandatory. Multi-Device – Ability to hide accounts from all but the primary account. Multi-Account – Multiple, entirely separate accounts in one wallet. Multi-Signature – Create multi-signature accounts between many people, where a certain amount of people’s signatures is required to sign a transaction. Some can be required before a transaction is signed. Native support for many currencies – Multiple currencies are supported, accessed all from the same wallet and backup keywords. Advanced Coin Control (Choose which UTXO are involved in the transaction), multiple destinations and manual fee settings. 2FA support for enhanced security, also available via Telegram. Wrong-Currency detection. The server knows if someone sends BTC to a BCH address and visa versa and automatically creates a new account to be able to recover the funds. Safer than ever! Desktop Light Wallet – Anonymous and fast! With Guarda Multi-currency Desktop Light Wallet you don’t need to register. Guarda has no access to your private keys or funds. You can receive, send, store, buy and exchange cryptocurrencies in complete anonymity and safety. All these features are available on Linux, Windows or MacOS. Choose the one that suits you! HolyTransaction gives users access to the crypto world with a universal cryptocurrency wallet and instant exchange. HolyTransaction features a cryptocurrency exchange where you can exchange between all popular currencies with just a few clicks. Instant send from one currency to another. Simple to use – With a simple, no-handdles GUI, anyone can now use and have access to cryptocurrency. Cutting-Edge security – Following industry-best standards, and guarentee that your money is safe. Utilising hot and cold storage wallets. Features an API whereby you can integrate cryptocurrency support into any website, from invoice processing to white-labelled multi-currency wallets. For more information, visit Holy Transaction here. NEXT is a modern, next-generation stylish open-source Desktop wallet. Modern User Interface – The interface is elegant and simple to use, perfect for new to cryptocurrency and veterans alike. In-Wallet Proposal Tab – Proposal tab will allow users to view all proposals and/or easily create a proposal. For more information, visit NextWallet here. We’re not here to reinvent the wheel. We’re here to make it run smoother for you, and we provide some of the most useful services you’ll find on the internet, made in a way that is easy to understand and use on a daily basis. In short, we’re a bunch of people that claim to be Crypto Evangelists. We strongly believe in cryptocurrencies, and our main promise is to push them up so more people get involved and take all the advantages they offer. Back in 2014, the world was taken by storm when Facebook approved the first cryptocurrencies tipping apps. The first was for Dogecoin, and the second was for multiple coins. The project was hosted on whitepuma.net, and persisted for almost two years, built up a massive user community and gave a home to Bitcoin, Litecoin, Dogecoin and dozens of other bitcoin-based altcoins. After very active months, the tipping hype started to fade away. Then, the developers decided to jump into the next stage: bringing not only tipping, but also mining and a widget that could be embedded on websites to allow everyone to accept payments. Sadly, the work was never completed because the project started to require an unsustainable amount of resources. Then, in a painful decision, a shutdown was announced by December 2015. A couple of months after whitepuma.net was closed, the source code was released by its creator as Open Source on GitHub. But it wasn’t maintained. Now, some of the original members of the dev and admin teams gathered up with a handful of the WhitePuma’s elite users, and decided to make something good with the best pieces of the old source code. That, with fresh new ideas and the power of the BardCanvas engine, synthesized the core of Blockchain Financial. More info about Blockchain Financial wallet on . Huobi was founded in China and is now based in Singapore, with offices in Hong Kong, South Korea, Japan and the North America, currently sitting #3 in volume on Coinmarketcap. Huobi is a great leap forward for our growing presence in Asia and we are very excited to be listed here! You can find the official Huobi announcement here. A new major Groestlcoin Core version 2.16.3 is now available for download which includes both a Denial of Service component and a critical inflation vulnerability, so it is recommended to upgrade to it if you are running a full Groestlcoin node or a local Groestlcoin Core wallet. v2.16.3 is now the official release version of Groestlcoin Core. This is a new major version release with a very important security updates. It is recommended to upgrade to this version as soon as possible. Please stop running versions of Groestlcoin Core affected by CVE-2018-17144 ASAP: These are 2.13.3 and 2.16.0. As a result in this, all exchanges and services have been asked to upgrade to this version, so please be patient if wallets go in to maintenance mode on these services. What’s new in version v2.16.3? This is a major release of Groestlcoin Core fixing a Denial of Service component and a critical inflation vulnerability (https://nvd.nist.gov/vuln/detail/CVE-2018-17144) exploitable by miners that has been discovered in Groestlcoin Core version 2.13.3 and 2.16.0. It is recommended to upgrade to 2.16.3 as soon as possible. If you only occasionally run Groestlcoin Core, then it’s not necessary to run out and upgrade it right this second. However, you should upgrade it before you next run it. If you know anyone who is running an older version, tell them to upgrade it ASAP. Stored funds are not at risk, and never were at risk. At this time we believe over half of the Groestlcoin hashrate has upgraded to patched nodes. We are unaware of any attempts to exploit this vulnerability. However, it still remains critical that affected users upgrade and apply the latest patches to ensure no possibility of large reorganizations, mining of invalid blocks, or acceptance of invalid transactions occurs. In Groestlcoin Core 2.13.3, an optimization was added (Bitcoin Core PR #9049) which avoided a costly check during initial pre-relay block validation that multiple inputs within a single transaction did not spend the same input twice which was added in 2012 (Bitcoin Core PR #443). While the UTXO-updating logic has sufficient knowledge to check that such a condition is not violated in 2.13.3 it only did so in a sanity check assertion and not with full error handling (it did, however, fully handle this case twice in prior to 2.1.0.6). Thus, in Groestlcoin Core 2.13.3, any attempts to double-spend a transaction output within a single transaction inside of a block will result in an assertion failure and a crash, as was originally reported. In Groestlcoin Core 2.16.0, as a part of a larger redesign to simplify unspent transaction output tracking and correct a resource exhaustion attack the assertion was changed subtly. Instead of asserting that the output being marked spent was previously unspent, it only asserts that it exists. Thus, in Groestlcoin Core 2.16.0, any attempts to double-spend a transaction output within a single transaction inside of a block where the output being spent was created in the same block, the same assertion failure will occur. However, if the output being double-spent was created in a previous block, an entry will still remain in the CCoin map with the DIRTY flag set and having been marked as spent, resulting in no such assertion. This could allow a miner to inflate the supply of Groestlcoin as they would be then able to claim the value being spent twice. If present, libsecp256k1 is used to speed up elliptic curve operations. The library is bundled in the Windows, MacOS, and Android binaries. On Linux, it needs to be installed separately. Transactions that are dropped from the mempool are kept in the wallet as ‘local’, and can be rebroadcast. Previously these transactions were deleted from the wallet. The scriptSig and witness part of transaction inputs are no longer parsed, unless actually needed. The wallet will no longer display ‘from’ addresses corresponding to transaction inputs, except for its own inputs. The partial transaction format has been incompatibly changed. This was needed as for partial transactions the scriptSig/witness has to be parsed, but for signed transactions we did not want to do the parsing. Users should make sure that all instances of Electrum-GRS they use to co-sign or offline sign, are updated together. Note that for the online address + offline HD secret case, you need the offline wallet to recognize the address (i.e. within gap limit). Having an xpub on the online machine is still the recommended setup, as this allows the online machine to generate new addresses on demand. Segwit multisig for bip39 and hardware wallets is now enabled (both p2wsh-p2sh and native p2wsh). Ledger: offline signing for segwit inputs (#3302) This has already worked for Trezor. Offline segwit signing can be combined with online imported addresses wallets. Added Revealer plugin. ( https://revealer.cc ) Revealer is a seed phrase back-up solution. It allows you to create a cold, analog, multi-factor backup of your wallet seeds, or of any arbitrary secret. The Revealer utilizes a transparent plastic visual one time pad. Fractional fee rates: the Qt GUI now displays fee rates with 0.1 gro/byte precision, and also allows this same resolution in the Send tab. Electrum-grs is a lightweight “thin client” groestlcoin wallet Android based on a client-server protocol. Its main advantages over the original Groestlcoin client include support for multi-signature wallets and not requiring the download of the entire block chain. Two-factor authentication is available on Android. Note that this will only provide additional security if one time passwords are generated on a separate device. Semi-automated crash reporting is implemented for Android. Qt/Kivy: added “gro” as optional base unit. Kivy GUI: significant performance improvements when displaying history and address list of large wallets; and transaction dialog of large transactions. Groestlcoin EasyVanity is a Windows app is built from the ground-up in C# and makes it easier than ever before to create your very own bespoke Groestlcoin address(es), even whilst not connected to the internet! You can even generate multiple keys with the same prefix and leave it on overnight whilst your CPU or GPU collects and stores these addresses locally. If you’re tired of the random, cryptic addresses generated by regular groestlcoin clients, then Groestlcoin EasyVanity is the right choice for you to create a more personalized address. • EasyVanity’s search is probabilistic, and the amount of time required to find a given pattern depends on how complex the pattern is, the speed of your computer, and whether you get lucky. • EasyVanity includes components to perform address searching on your CPU (vanitygen) and your OpenCL-compatible GPU (oclvanitygen). Both can be built from source, and both are included in the Windows binary package. • Prefixes are exact strings that must appear at the beginning of the address. When searching for prefixes, Easyvanity will ensure that the prefix is possible, and will provide a difficulty estimate. • The percentage displayed just shows how probable it is that a match would be found in the session so far. If it finds your address with 5% on the display, you are extremely lucky. If it finds your address with 92% on the display, you are unlucky. If you stop EasyVanity with 90% on the display, restart it, and it finds your address with 2% on the display, your first session was unlucky, but your second session was lucky. • EasyVanity uses the OpenSSL random number generator. This is the same RNG used by groestlcoin and a good number of HTTPS servers. It is regarded as well-scrutinized. Guessing the private key of an address found by EasyVanity will be no easier than guessing a private key created by groestlcoin itself. • To speed up address generation, EasyVanity uses the RNG to choose a private key, and literally increments the private key in a loop searching for a match. As long as the starting point is not disclosed, if a match is found, the private key will not be any easier to guess than if every private key tested were taken from the RNG. EasyVanity will also reload the private key from the RNG after 10,000,000 unsuccessful searches (100M for oclvanitygen), or when a match is found and multiple patterns are being searched for. • Free software – MIT. Anyone can audit the code. • Written in C# – The code is short, and easy to review. Sentinel accepts XPUB’s, YPUB’S, ZPUB’s and individual Groestlcoin address. Once added you will be able to view balances, view transactions, and (in the case of XPUB’s, YPUB’s and ZPUB’s) deterministically generate addresses for that particular wallet. What is Groestlcoin P2SH Paper Wallet? Groestlcoin P2SH paperwallet is a simple groestlcoin paper wallet generator that utilizes Segregated Witness (SegWit) Pay To Witness Public Key Hash (P2WPKH) addresses and transactions. The P2SH paperwallet supports creating P2SH paperwallets in bulk, keypair generation with QR codes and sweeping tool. Groestlcoin believes strongly in privacy, the live version does not collect and store IP or transaction data. Details section to validate private keys and to view corresponding segwit address, public key and redeem script. Key Sweeping Tool to move all funds belonging to a single SegWit private key. What is Groestlcoin BECH32 Paper Wallet? Groestlcoin BECH32 paperwallet is a simple groestlcoin paper wallet generator that utilizes Segregated Witness (SegWit) Pay To Witness Public Key Hash (P2WPKH) addresses and transactions. The BECH32 paperwallet supports creating BECH32 paperwallets in bulk, keypair generation with QR codes and sweeping tool. Groestlcoin believes strongly in privacy, the live version does not collect and store IP or transaction data. Detail section to validate private keys and to view corresponding segwit address, public key and redeem script. What is Groestlcoin Web Wallet? Groestlcoin Webwallet is an open source, multisignature, HD Wallet and more! 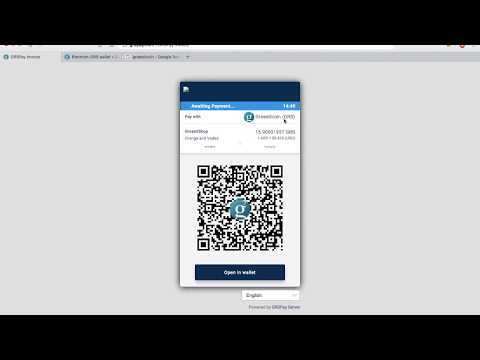 Webwallet is a a open source browser based Groestlcoin webwallet.